Michael has an English father and Scottish Grandmother. Yet, despite this, he lives in Toronto and he’s Australian! What drove Michael to get engaged with this whole area of coaching was a frustration that it always shows up with baggage attached – life coaching (a weird Californian thing full of touchy feely hugging) or business executives that have to be hard driving executives or sports coaching, which is about ordering people to run around a field. What are we even talking about. So, for Michael the starting point was to figure out what do we mean by coaching. Or being more coach-like. Human beings are advice giving maniacs. We love to tell people what to do. Yet, we don’t even know what the problem is most of the time. But we are so trained to be the person with the answer. We are so trained to “add value” in the conversations that we have, that we LEAP to telling people what to do. There is something very powerful about SLOWING DOWN the conversation, just a little bit, with a few good questions. Because you get to your outcome more quickly, more effectively, more elegantly. Michael starts his book “The Coaching Habit” with a chapter on habits. How do you build new habits? Nobody needs any more information about how to show up as a better man, a better woman, Dad, parent, Mentor or leader. We know this stuff. How do we shift our behaviour? Habits are the building blocks of behaviour change. So, if you want to do things differently, or elevate the way you SHOW UP IN YOUR LIFE, like building a healthier, fitter, more compassionate life, what you need to know if you want to accelerate this is HOW DO I BUILD STRONG HABITS. When this happens – that’s when you define the moment, the trigger or situation where you are looking to change your behaviour. I will – define your new habit that will take 60 seconds of less to complete. This is the platform Michael uses to lead people into the coaching questions. The problem it solves, is nobody feels like they have time for coaching, your in-box is way too big…I’m just really busy. Fact, you are, but Michael’s belief is that if you cannot coach in 10 minutes of less, you just don’t have time for coaching. So, get into the conversation FAST. What’s on your mind is an open question. It says to the other person in the conversation, YOU TELL ME WHAT WE SHOULD BE TALKING ABOUT. Not everything, just what’s on your mind. The thing you are excited by, or anxious about, or worried by or nervous by. That thing that’s waking you at 4am in the morning, or the thing that’s making you eat a slice of cheesecake at mid-night. What’s that which is on your mind? This conversation will go to a place that’s juicier more quickly. Have context for the conversation opener what’s on your mind. Bang, you are into something interesting. The first and seventh are bookend questions. Start strongly and finish strongly. Michael recommends a booker by Stephen Pinker Stumbling into Happiness – a study about happiness, but about cognitive biases. How memory works. Pinker says your memory of an experience is influenced what happens FIRST and what happens LAST. Focus on the start, focus on the end. Work on your first 2 minutes as a speaker. 2 FOCUS Question – What’s the real challenge here for you? The second question in The Coaching Habit makes sure you don’t solve the wrong problem, it’s not necessarily the first issue that shows up. Don’t jump in. Real challenge. Recognises that there is more than one issue. They need to decide. For YOU, make it about supporting the person sitting in front of you. 3 AWE question – And what else? This question works with any other question. The first answer is rarely the right answer. Love that, what else is a challenge, what else is the real challenge her for you? This deepens the conversation. It becomes more vulnerable, quicker and presents real learning opportunities right off the bat. The question impacts the other person. It goes broader and deeper. It is a self-management tool to STOP you jumping in and staying MORE CURIOUS. 4 The Foundation Question – the goldfish question, they get the goldfish reaction – what do you want? Simple to say, but sometimes difficult to ask and often difficult to answer. That said, this question is a great conversation sharpener. It shakes up the conversation. So, what’s the real challenge for you? OK, so if that’s the real challenge for you, what do you want? So often people are unclear about what they want. In understanding what you want, at that moment the path forward almost always becomes clear. It’s supper helpful for you and the person answering. These questions HELP YOU stay curious. Marshall Rosenberg – he draws the distinction between wants and needs. 5 The Lazy Question – segues – So, what do you want from me, or how can I help? This forces that other person to make that clear request so you know what they are looking for. Once you hear what they want, what they want from you, how you can help, YOU get to say YES or NO or MAYBE to that. I cannot do that, but I could do this instead. Or I cannot do that, is there anything else I could do, that could be helpful? Or, yeah, I can do that no problem. In a customer-supplier relationship if you have asked how can I help, what can I do, you have a very specific requirement on the table. If you do that thing, you are pretty much guaranteed 100% satisfaction. Can you ask for what you want, knowing the answer may be no? Its harder to think to know what you want. It’s not easy but a powerful place to live your life. Bad work, – mind numbing bureaucracy. Good work – what you are supposed to be doing. Great work – has more meaning. Right people and are they doing the right things? % split on these. How much bad work, good work and great work do they have at the moment. What’s the best mix for me right now between good work and great work? Who has too much great work? No magic percentage, but just ask the question. Pareto principle applies. A small part of what you do makes the bigger difference in what you do. What do I care about, what lights me up? If you ask that, then the strategic question is: If I am saying YES to that, what must I say NO to? What will you say no to so your yesses have more meaning? Most of what we do daily is habit. 45-50% of waking activity is habitual – you are reacting to stimulus. Helps the brain. It’s smart, but there is a price you pay. Your goal as a teacher of staff, is to allow your staff to learn. 7 The Learning Question – What was most valuable to you here? 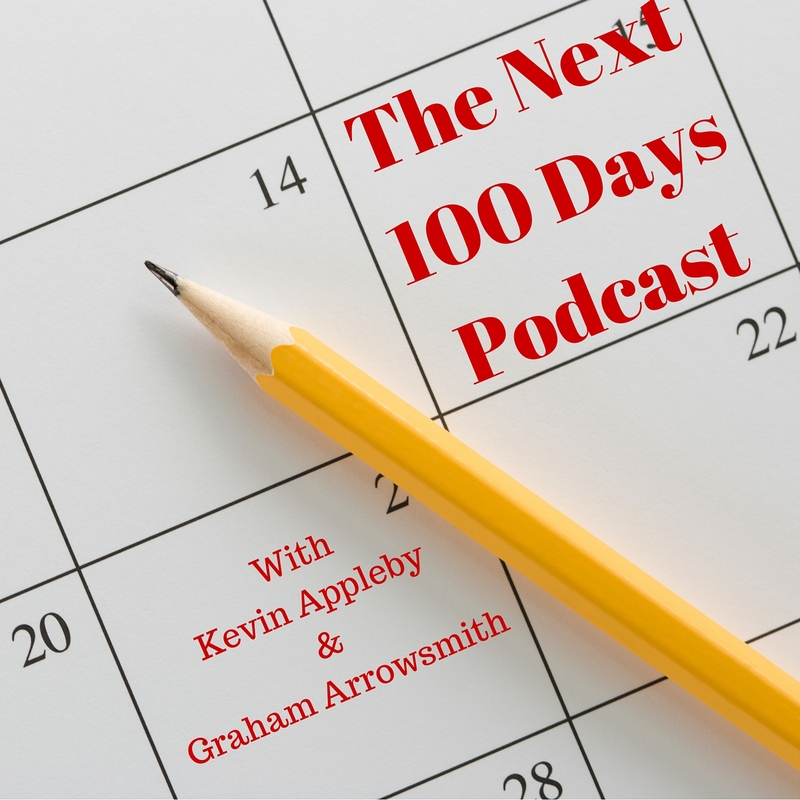 The Next 100 Days is action focused, so there are options for you dear reader to say what have you learnt from the podcast and can play out in the next 100 days.